PM Narendra Modi unveiled his statue in Haryana, Chautala too had installed one earlier. A look at the Jat leader’s legacy. On Tuesday, Prime Minister Narendra Modi unveiled a statue of Jat leader Sir Chhotu Ram (1881-1945) in Haryana, a state that had witnessed a violent Jat agitation three years ago. The 64-foot statue, at Chhotu Ram’s village of Garhi Sampla, Rohtak, is a result of the efforts of Union Steel Minister Birender Singh, a grandson of Sir Chhotu Ram. Why is Chhotu Ram important to any party that seeks to woo the Jat community? At the same spot where the statue was unveiled Tuesday, a smaller statue had been installed in November 2004 by Indian National Lok Dal (INLD) leader Om Prakash Chautala, then Haryana Chief Minister. The current BJP regime recently had the earlier statue moved elsewhere. In his efforts to appropriate the legacy, Chautala had once brought Chhotu Ram’s personal belongings, stored by the family of Nawab of Malerkotla at his haveli in Lahore, and had them displayed at a museum at his village. Chautala’s opponents had mocked him, with former Congress MP Jai Prakash claiming that Chautala’s father, former Deputy Prime Minister Devi Lal, had once shown black flags to Chhotu Ram. While Chautala denied the charge, the fact remains that Devi Lal and Chhotu Ram were political rivals. For historical reasons, the entire Devi Lal clan had steered clear of Chhotu Ram. Critics may call Chhotu Ram a caste leader, but he also sought to articulate the suffering of the peasantry. His basic thesis was that farming was the primary human activity. Chhotu Ram came from a debt-ridden family who held 10 acres of arid land. The Hindi-speaking southern region of undivided Punjab (now Haryana) witnessed frequent droughts and famine, leading to dependence of farmers on moneylenders. Patronised by Sir Chhaju Ram, a Jat businessman and philanthropist, Chhotu Ram studied at the Christian Mission School at Delhi, and later at St Stephen’s College, before getting a law degree from Agra College. As he began legal practice in 1912, Chhotu Ram founded the Jat Sabha, followed by the launch of the Jat Gazette in 1915. 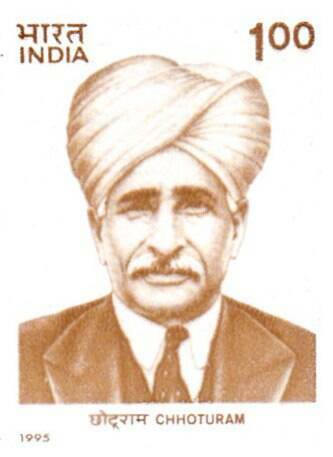 He joined the Congress in 1916 and was president of the Rohtak District Congress Committee from 1916 to 1920. Chhotu Ram helped in the British Army recruitment effort for the First World War, and was instrumental in the recruitment of 22,144 Jats from Rohtak area. He again backed a massive recruitment drive of the British during the Second World War. The Congress boycotted the 1920 elections, while Chhotu Ram got elected on a Zamindara Party ticket. In 1923, he formed the Unionist Party in alliance with Fazl-e-Hussain and Sir Sikandar Hayat Khan. Under the leadership of Khan, the party won the general elections of 1936 and formed a coalition government along with the Congress and Sikh Akali Dal. Chhotu Ram became the Revenue Minister. As a member of the pre-Partition Punjab Legislative Council, his first major achievement was the passage of the Punjab Land Revenue (Amendment) Act, 1929, which remains a landmark social legislation till date. The exploitation of the peasantry by moneylenders was brought to an end with a series of measures, starting with the Punjab Regulation of Accounts Act, 1930. It was followed by the Punjab Debtors Protection Act of 1936 and the Punjab Relief of Indebtedness Act, 1943. It became mandatory for moneylenders to register themselves, without which they could not advance loans or prosecute farmers. All land attached and sold after June 8, 1901, and mortgaged for 37 years, was restored to its owners. Farmers were required only to give an application on plain paper to the district collector. If any moneylender had recovered twice the loan amount, the farmer was given his land back. Reconciliation boards were set up; confiscation of milch cattle, oxen, camels and carts or means of earning was barred. The Punjab Agricultural Produce Markets Act was passed in 1939. Popularly called the Mandi Act, it provided for the constitution of market committees in notified areas, and helped free the farmer from exploitation. A consolidation of land holdings was undertaken after passing the Consolidations Holding Act, 1936, amended in 1945. Not only were all these laws passed; Chhotu Ram also ensured their implementation. A grateful peasantry rewarded him with the titles of Deen-bandhu and Rahbar-e-Azam. The British honoured him with a knighthood in 1937.